My name is David Gilley, I've been in contact with quite a few people via PM here and thought I would share a design in OSLO for a 10 inch refactor. Some background, in the near future I will be moving to a darker location in Florida and am looking for a "rest of my life telescope" and for various reasons a large refractor is of more interest to me than a large dobsonian. A few months ago I downloaded the free version of OSLO, quite a learning curve. I still have much to learn, but wanted to thank everyone who responded for their assistance and passing along their knowledge, I do appreciate it. I may end up just purchasing an already fabricated lens, I've been advised that these particular glasses are difficult to work with and acquiring blanks of the necessary quality in this size may be cost prohibitive, but thought I would post this design, even though it may not see the light of day (or night). At work, they call such glass Kriptonite! One issue you run into immediately is glass availability in these larger sizes. Fortunately, I got a list from Brion Hoffman (Ohara North America) of glasses available over 200mm diameter, and your glasses are in that list. Zemax shows S-PHM52 cost to be 2.2X S-BSL7, and S-LAM60 cost is 1.4X S-BSL7, but those scale factors don't account for large blank sizes. The glasses are available, but those costs may be higher than the S-BSL7 base cost because of their size and extra annealing requirements. You'll need to contact Ohara to make sure the glass is available, and find out the cost and how long it will take to get. It could take 9 months or longer to get your blanks. They're not sitting on a shelf somewhere ready to ship. The problem I'm seeing in the design is spherochromatism at 0.5461µm, 0.56µm and 0.58756µm. You're going to have to slightly aspherize one surface to sharpen it up. The rear and flattest surface requires the least glass removal. Your glass selection gives slightly better than the S-BSL7 and S-TIM2 combination. 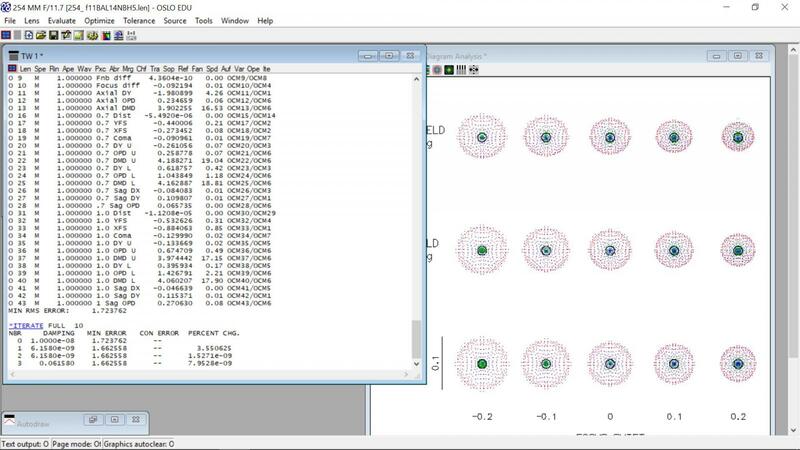 Try designing with those as well and look at your rayfan plots and spots. Aspherize the rear surface on both designs to clean up the green-yellow spherochromatism, and get back to us with your results. Hi Mike, you have most useful information about the glass availability, top answer. If I may ask questions, here are some in my mind. 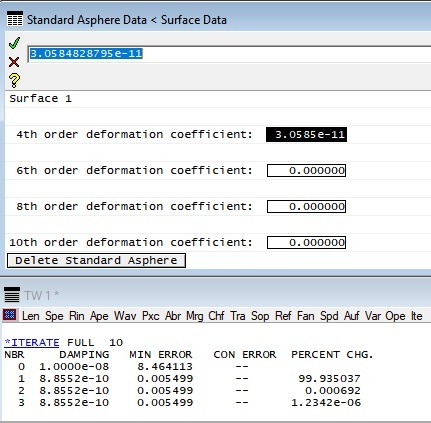 Is surface 4 the best for aspherisation ? I was wondering too about mechanical aspect. 8kg is such a mass to hold, tension on the rear glass could be a problem. Is 2mm airgap and 3 spacers a good idea to hold the 3kg front lens ? Should it be a bigger gap and a separated hold for each lens ? Hi Mike, thanks for replying. I'm actually surprised that these glasses are even available in this size. Is it best to contact Ohara the old fashioned way by phone instead of email? I'm not that concerned regarding the time factor as it will likely be a year or longer before I have a site for the telescope. I'll see if I can figure out how to calculate the coefficients for an asphere, honestly math was never my strong suite even 35 years ago in school, but I'll give it a go and see about posting the results. Hope this isn't derailing my own thread, but since you mentioned BSL-7, I'm in contact with a fellow who has a 10 inch blank of BK-7 for sale with melt data...I just noticed the Jim Egger thread regarding the triplet he has fabricated. 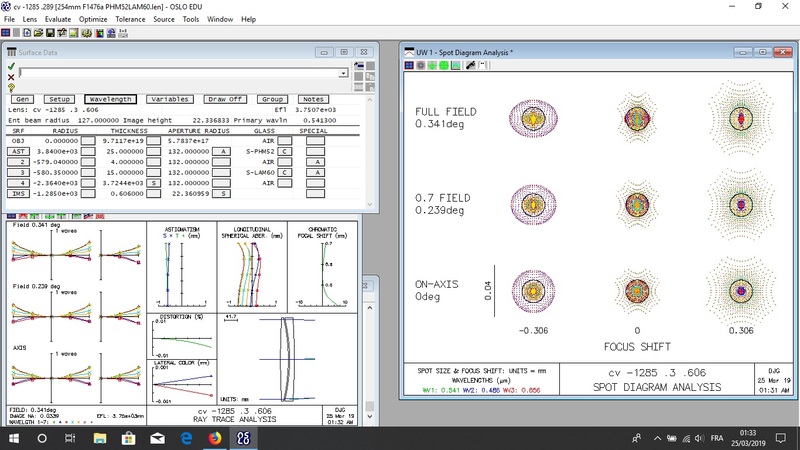 This gives me the idea for a doublet with Ohara NBM-51 (KzFSN4 equivalent), is that also on the list of available glasses in >200mm diameter? Perhaps the F ratio could be reduced somewhat to lessen the mounting requirements. One issue you run into immediately is glass availability in these larger sizes. Fortunately, I got a list from Brian Hoffman (Ohara North America) of glasses available over 200mm diameter, and your glasses are in that list. Zemax shows S-PHM52 cost to be 2.2X S-BSL7, and S-LAM60 cost is 1.4X S-BSL7, but those scale factors don't account for large blank sizes. The glasses are available, but those costs may be higher than the S-BSL7 base cost because of their size and extra annealing requirements. You'll need to contact Ohara to make sure the glass is available, and find out the cost and how long it will take to get. It could take 9 months or longer to get your blanks. They're not sitting on a shelf somewhere ready to ship. The central lines spherochromatism with the combination quoted is quite small, about 1/9 wave p-v of balanced 4th/6th order SA, comparable to 1/13.5 wave p-v of primary spherical. But I agree with Mike it makes a better design without it. Another way to achieve that is simply by choosing two glasses that are a better match. The higher-order residual results from the discrepancy in their chromatic/refractive properties, requiring relatively large difference in the inner two radii r.o.c. for the correction of the bulk of SA, primary spherical. I would expect most other combinations to have smaller or negligible higher-order residual. Can I ask, if Mike's recommendations are better than garden variety crown-flint combo's ??? The Lanthanum lenses we do here, nobody wants to see them coming. They are hard, and relatively difficult to work with in fine grinds, and meeting Zernikies to quality. I might be all wet, but these glasses are a PITA. 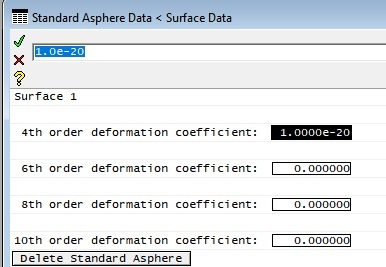 if strongly aspherized spherical aberration is decreased... Maybe the conic and air gap be better. I did it fast for discussion. Looks like that cleaned things up nicely, at least to my inexperienced eye. I'm still puzzling about how to do the equations for the coefficients for aspherizing. I would be remiss if I didn't mention that when I started fumbling around on Oslo a month ago Mladen helped me out greatly with a design using PHM-52 and NBM-51, I'll attach that. I scaled up a 100mm BSL-7/TIM-3 design I downloaded from CN, it's not aspherized but I'll attach that as well. Yes, after trying quite a few non traditional combinations of glass on Oslo, I see that the delta in the Abbe numbers of the two glasses needs to be a certain threshold to avoid needing strong internal radii and the resultant spherochromatism. The glass data Zemax shows comes directly and only from the glass suppliers. 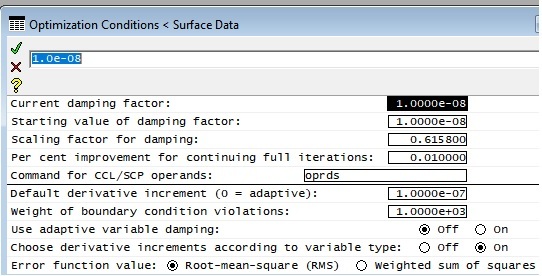 In Ohara's case you can download their spreadsheet and find that it's exactly what Zemax shows. Regarding which surface is best to aspherize, Zemax has a utility that gives the best surface based on performance improvement. I improved on that utility by writing a macro to cycle through all surfaces of any lens and also sort and list all the best-fit P-V and RMS departures, something Zemax doesnt directly do. In David's lens, aspheres on any surface gave about the same improvement in performance, but R4 also gave the least material to remove. I'm still puzzling about how to do the equations for the coefficients for aspherizing. Thanks a bunch for taking the time to post this tutorial, I appreciate it. I went through the steps, but when I got to the iterate command it appears my version of Oslo has that disabled. As someone who makes optics for a living I do value your opinion highly, as I have zero experience in that regard. Actually what led me to this line of thinking was a post by Bill Paolini regarding the 80mm "Planet Hunter" designed by Thomas Back. It used PHM-52 and instead of LAM-60 used LAH-51. https://www.cloudyni...anet-hunter-80/ It must be exponentially more difficult to work with a 260mm blank as opposed to an 84mm blank of the stuff. If I had some, I would use a glass tool, with grooves. It would be handy if you could get it pre-generated; and the tool with a corresponding matching curve. It will save you a -LOT- of time! One of the main issues in optical design is the a crazy surface (like a strong asphere), glass the cost, size and availability of the materials, will a company work with it, IE the optician may want to find a close fire hydrant (check the old ATM books for that quote) I was once told I had a great advantage over most designers, I knew what I could get away with, because I was the guy who was going to make it! It's important to look at the feed back from others. My guess it's going to cost a few thousand to get this made. Between the glass cost, tooling, handling, testing, and don't forget coating. If the glass does not do well in the coating process, that could be an issue too! Oh yes, I aggree, not for a novice grinder. I take a look at S-LAH51 is a bit cheaper, similar about hardness and acid sensitivity. Correction is not as good but (fast check) I think surfaces would have less curvature. Abbe differential is a valid, basic indicator of the level of higher-order SA residual, but it doesn't tell the whole story. It determines how strong are the inner radii, but what will also enlarge this residual is a larger inequality in the radii value, even if they are not more strongly curved than the near-equal radii. One example is Schott ZKN7 vs. LAKL21 or Ohara S-BSM81 mated with FPL-53 (or 55). The latter two have somewhat larger Abbe differential, and slightly better partial dispersion, yet will generate significantly more of a higher-order SA residual. Myself and a number of ATM friends that have built refractors have been down this road, and our conclusion has been that anyone that is considering building a large refractor should seriously consider the Schupmann design. It solves many of the problems out lined in the above post. It uses two pieces of cheap BK-7 so the cost is low, in the all spherical design you have spherical surfaces so no crazy aspheres to figure. The tolerance are wider then a typical APO or Achromat so easier to make and most important it has near perfect color correction better then almost all APOs. Here is an OSLO file for 10" f/10 Schupmann. Let me point out these scopes have been made and are not "paper designs". They work. Edited by DAVIDG, 26 March 2019 - 10:11 AM. Yep, I agree, seen a few Schupmann's and judged a few at RTMC. Great suggestion and worth looking to. I designed a paper scope, (all spherical surfaces), used simple glasses (BK7 and F2, so any one can make one) published in TM, had it made and won a merit award at RTMC. My caution was the type of glass that was being looked into. Just because it's in the software it may not be a good one to work with, in cost and processing. I would suggest looking at the glass manufacturer's web sites for the latest information on cost and it's availability. Then decide. Being a designer, one needs to check the limits of the design beyond the computer. manufacturers, they may not talk to you for such a small order. (They will send you in that direction anyway.) Also check the web site for the details of the limits of the glass. Such as: Nd and Vd tolerances, Homogeneity Grade, Striae Grade, Molded or Cut (Molding is out of the question for small order) Do your homework up front, see attached for suppliers, I am sure others have suggestions. Edited by Oregon-raybender, 26 March 2019 - 12:02 PM. Thanks for the advice and links Robert. Looking at your signature it sounds like you've been grinding glass since I was in kindergarten, and I'm of the age now that I could join aarp...so I'll certainly weigh my options. I actually haven't ruled out a schupmann, I need to do some more investigating about them, the design Dave posted looks great.